When the early sun burns away the last of the misty night in Majdal Shams it leaves a landscape that looks a little like model railway scenery - all evenly-shaped pale hillsides and symmetrical thickets of darker green trees and patches of grey rock. When the noise of gunfire dies away in such a place, the silence that follows has an air of unreality. It feels too still and too deep. It must have felt this way in 1967 when the guns fell silent at the end of the Six Day War leaving Israel in possession of the rich farmland and spectacular mountains of the Golan Heights. It felt like it again this week, on the 44th anniversary of the war, as peace returned after a grim and extraordinary few hours in which Israeli soldiers fired live ammunition at pro-Palestinian protesters trying to breach the border fence. Several were reportedly injured or killed. Properly speaking, the line that divides the two hilltops - one under Israeli control and one in Syria - is a line of disengagement, not a border, since there is no peace deal to make it permanent. We had been watching as the unarmed protesters shuffled and slipped down the Syrian hillside to the deep trench filled with razor wire which now marks the frontier. 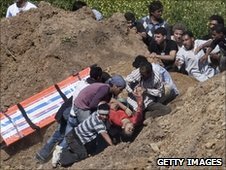 Within perhaps an hour the protesters found themselves pinned down by live gunfire directed down the slope at them by Israeli soldiers. 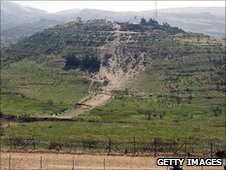 The only cover available to the demonstrators was a mound of earth displaced by Israeli army engineers over the last few days as they reinforced their line between the hills. 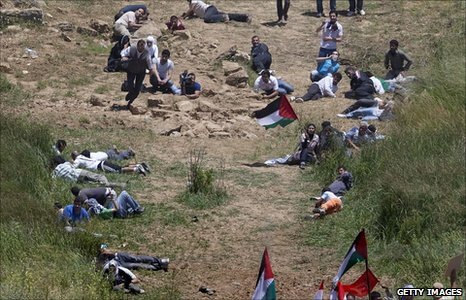 There had been warnings in Arabic and warning shots - but from the moment the demonstrators began to move down the hillside, the unfolding events of the afternoon seemed at once horribly inevitable and at the same time horribly unreal. Something in the futility of the protests - the way the demonstrators were stuck at the razor wire perhaps - conjured echoes of the vulnerability and pathos of soldiers fighting in World War I. Except, of course, that the groups we watched carried no firearms. Over the course of perhaps six hours they risked their lives to reach the fence, scrambling or somersaulting over the top of the earth mound into the relative safety of the ditch below. Every time someone made it a shot rang out from the Israeli soldiers above. There was no possible gain beyond the symbolic gesture of trying to breach the fence and the opportunity to expose Israel's readiness to use deadly force. And, not surprisingly, no-one made it anyway. They seemed like small returns for such a deadly risk. The casualties were manhandled awkwardly on stretchers back up the steep hillside and into ambulances, then disappeared into the chaotic uncertainties of a crumbling police state. There is no way of knowing how many people were killed. Syria says 22 or 23 but such is the low priority attached to truth-telling there that those figures are meaningless. Equally meaningless is the Israeli assertion that the Syrians are clearly exaggerating - they may well be but the Israelis have no idea if the live ammunition they claim to have aimed at the feet and legs of the protesters, left people bleeding to death as they waited for treatment. In the Middle East once you have chosen between the irreconcilable narratives on offer, everything confirms the narrative you have chosen, and nothing confounds it. In the eyes of enemies, Israel will have confirmed itself as a brutal, ruthless, militaristic and expansionist state, because it has no internationally-recognised legal right to the Golan Heights. And the Israel of Majdal Shams hardly seems like the Jewish David ranged against the collective Goliath of the Arab world. But the idea that such incursions might become a regular tool of their enemies evokes the Israeli national nightmare of Palestinians massing on their borders demanding the right of return. And Israel sees the protesters as extremists or followers of extremists. In that context it calculates that anything short of an immediate resort to overwhelming strength would seem like weakness. But there is another kind of weakness in the way Israelis struggle to understand their enemies. They tend to assert - without offering proof to me at least - the protesters at such events are paid according to a kind of rate card - $50 (£30) if you turn up for a demonstration, $900 (£550) if you are shot and injured, $10,000 (£6,000)if you are killed. Someone who is prepared to risk their life for $50 is going to make a pretty desperate long term enemy. And above all, Israel sees Syrian government manipulation in all this - a cynical attempt by the blood-soaked regime of Bashar al-Assad to start people in the Arab world talking about tension on its borders, rather than the terror within them. If that is true then it is darkly ironic that the grim events at Majdal Shams were overshadowed within a day by a massacre of Syrian government troops at Jisr al-Shughour. The emptiest reflection of all - and a not uncommon one in these parts - is a day of violence which for many families will have changed everything, for the wider world has changed nothing at all.